This is hardly surprising. The company has grown through the vision and enterprise of its founder. Already a host of corporate stories are developing around him and his giant baby, recently valued at 35 billion dollars. Jack Ma fits the profile of the creative entrepreneur. His decisions are imaginative. He describes his leadership journey in vivid anecdotes which suggests that he has a well-developed transformational style. An English teacher and graduate of Hangzhou, Mr Ma became a skilled web site builder, one of the first in China. When he was thinking about going international he looked for a corporate name that worked in Chinese but which also had global connotations. Once when in America, someone mentioned the story of Ali-Baba to him, and he thought he had found what he was looking for. He tested his idea quickly and locally, as found there was surprising recognition of the story from the Arabian Knights, and the magic password Open Sesame which opened up a cave full of treasures.. Yes, my company could be remembered for opening up a place full of treasures, he thought. Ali-Baba had brought prosperity to his village. He listed the new name slightly differently, noticing that it was also effective when written in Chinese characters. Its Business relationship with Yahoo has been controversial. Alibaba grew and prospered under its founder-leader, Yahoo struggled to compete in its more global business. The announcement came a few days after Alibaba, which Ma founded in 1999, announced a sweeping restructuring that will divide the group into 25 business units under the direction of two committees, one for strategy and the other for operations. In an e-mail sent to Alibaba’s more than 24,000 employees worldwide on January 15, Ma said he decided to relinquish his position as chief executive because the company had people who “are better equipped to manage and lead an internet ecosystem like ours”. Ma described how he realised years ago that he was not suited to be a traditional chief executive of a big firm. He said that “at 48 I am no longer ‘young’ for the internet business”. What he aims to be is “a good partner to more capable colleagues”, which he intends to accomplish by continuing his role as executive chairman. Ma described the restructuring as “the most difficult reorganisation” in Alibaba’s history. But it is a bet to stay competitive in the mainland’s fast-growing e-commerce market. JP Morgan has estimated this market to be worth US$436 billion in 2015. 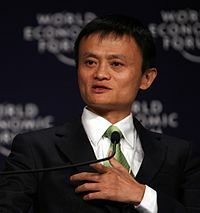 The move fuelled speculation that Ma was laying the groundwork for Alibaba’s initial public offering, which the company has denied. I’m afraid that piece of analysis would have not obtained a particular high grade, if it had been supplied in a student assignment on Alibaba’s prospects. Jack Ma biographic note on the man who is changing china. This entry was posted on Saturday, March 23rd, 2013 at 1:23 pm and is filed under Uncategorized. You can follow any responses to this entry through the RSS 2.0 feed. You can leave a response, or trackback from your own site.